"This recipe is great for summertime veggies from the garden, and quick too!" Warm oil in skillet and add chicken and onion. Cook 15 minutes or until chicken is browned and just about done. Add salt and pepper to taste. 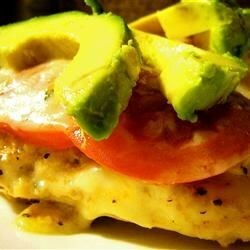 Place chicken on cookie sheet and top each breast with 1 to 2 slices of tomato and 2 to 3 slices of cheese. Place in oven for 10 to 15 minutes, until cheese melts. Remove from oven, add 2 to 3 slices of avocado on top of each breast, and serve immediately.